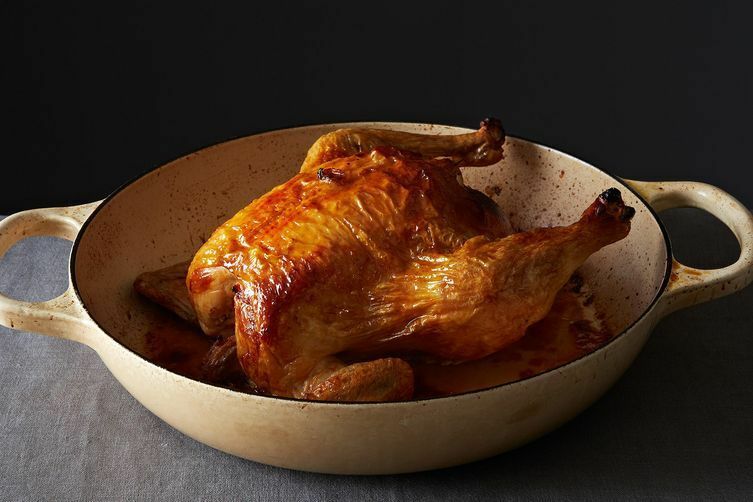 I have recently begun roasting chickens (for friends, not for my vegetarian self), and I find myself incredibly struck by it. Having been a vegetarian for my entire cooking life, there’s so much I don’t know. It’s a whole new ball game—a strange new anatomy to learn! Seasonings to explore! And then there’s the matter of the crispy skin. Everyone—even a vegetarian like myself—knows that shatteringly crispy is the holy grail of roast bird-dom. Even though “crispy skin” is sort of gross to say, the contrast of textures and flavors (caramelized skin, melty-sweet meat) is wonderfully pleasing to eat (or imagine eating). So how to go about achieving it? Well, getting the skin very dry (even leaving it uncovered in the fridge overnight) helps. 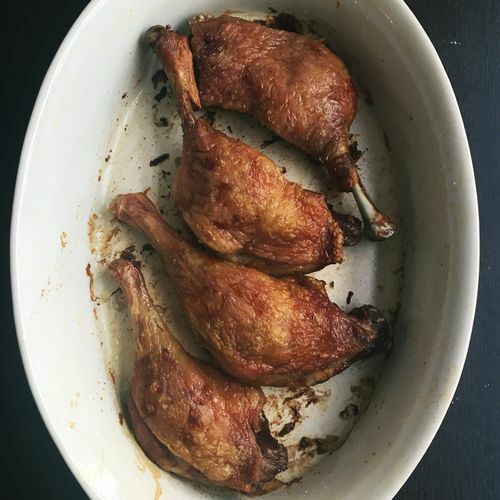 But there’s another technique for crispy skin, as demonstrated by Tanya on duck legs over on our app, that you may already have been applying to other meats—but not to poultry. Duck legs with super crisp skin: With a needle (I use a safety pin). Prick the skin of the duck legs all over, at an angle to avoid piercing the flesh – this will help the fat render. Place duck legs snugly into an oiled baking dish. Season generously with salt (and any herbs or spices you’d like). Cook low and slow in a 300 degree oven for 90 minutes to 2 hours. Crank the heat up to 375 for the last 15 minutes to brown the skin and serve. Do not forget to save the rendered fat to roast your next batch of vegetables. Prick the skin of the bird all over with a needle. Not full-on acupuncture, Tanya reminds. Just do it enough to score the skin rather than pierce it (she finds doing it at an angle is best). What tips would you give someone roasting their first bird? Tell us in the comments. This article was written by Caroline Lange from Food52 and was legally licensed through the NewsCred publisher network.